The bottom line is that this is a good cereal. All dietary considerations aside, it tastes great... think of Frosted Mini Wheats without the frosting. I had the Toasted Wheats "With Cinnamon Flavor" and it did have a subtle cinnamon punch. Some squares had more of a flavor punch than others. But that was more of a fun treat than an annoyance. I'm not sure this one will fly immediately with kids. It's miles away from the sugary cereals young folk really dig - you know, all those whose boxes now say "Now With Less Sugar". I have an idea though how you could turn your youngster on to this healthier cereal. Give it to them as a dry snack first. This is one of a select group of cereals I might prefer better dry. If you can get your kids to buddy up with this cereal dry, it's just a matter of time until they'll want it for breakfast. Generally speaking, the South Beach Diet is a good plan. 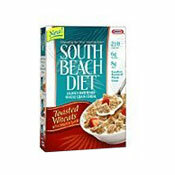 Unlike the Atkins diet that tries to fool your body into becoming leaner, the South Beach diet works with Mother Nature. It's a plan that basically promotes eating healthier versions of what we already put into our body... healthier carbs, healthier fats and leaner forms of protein. A 1 and 1/4 cup serving (which is actually quite filling) of South Beach Toasted Wheats has only 210 calories and provides 6 grams of protein and 8 grams of fiber. It has a smattering of other vitamins and minerals. Actually, in terms of vitamins that end with letters, some of the more unhealthy cereals win out. This cereal just came out, but it might already be time for Kraft to consider spraying down the cereal pieces with vitamins so they can totally dominate side-panel nutrition game. What do you think of South Beach Diet Toasted Wheats? I loved this cereal as well. Here one day and gone the next! I think we ought file a class action lawsuit against Kraft Foods for withdrawing a truly nutritious product off the shelf. I purchased my last box in in March of 2008. I have been in thearpy ever since. I've spent so much time searching in person, by phone and at the Kraft foods site trying to find South Beach Cereals for the last year. My favorite was Vanilla Almond Crunch, not too sweet, loaded with fiber and protein. Once I called and talked to a Kraft worker who said it was no longer available in the midwest (Ohio) due to marketing reasons. Then, I was able to get it from a relative whose store in Virginia sold it. Now, even the google links to sellers come up empty-handed and the Kraft site won't allow me to email an actual person. Guess it's time to give up! These were fabulous, healthy cereals and I think Kraft ruined their chances by marketing and distributing it poorly. Perhaps it was not in keeping with their high sugar, low nutrition philosophies shown in so many other cereals? 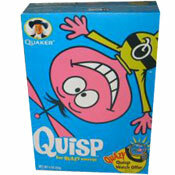 I loved this cereal but can't find it in the stores anymore. Is there a way to get it yet, or is it not available? Love the cereal but not available anywhere except Publix. I ate the plain version for over a year because it had everything a dieter could want... high fibr, low calorie, protein. Now you can only buy it with dried fruit or ''flavored'' and the calories went way up. Frustrating! I like the fact that this cereal is high in fiber. I've had digestion issues with other cereals but not this one. Only problem is, I can't find it in the stores anymore. What happened? It's frustrating. Love the cereal but can't find it anymore. Why isn't it in the stores? The other South Beach cereal is there but not the "toasted wheats". The cereal is Great... My problem is that I cannot find it in any stores. I found it once, tried it and than that was it. I went on a mission to every supermarket, but with no luck. People are not going to know about it, if it is not in stores.